Please join the Global Health program this Thursday, November 19, from 12:30-1:20 in LaForce 121 (Seminar Room) to chat with Dr. Nils Daulaire, a physician, global health leader and veteran of HHS, USAID, and WHO. As a global health expert, Dr, Daulaire can talk about career pathways and other paths into global health. Refreshments served and bring lunch if you want, or drop in at any time. Questions? Email Pam at pberenbaum[at]middlebury.edu. Hangouts are every Thursday, 12:30-1:20PM in LaForce 121 (Seminar Room). 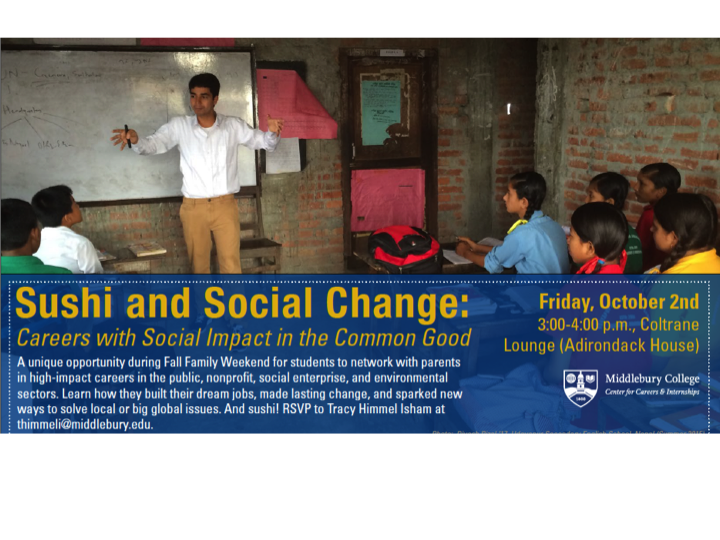 Your invited to a unique opportunity to participate in our networking event during Middlebury’s Fall Family Weekend titled “Sushi & Social Change: Social Impact Careers in the Common Good” on Friday, October 2nd from 3:00-4:00 p.m. in Adirondack House’s Coltrane Lounge. 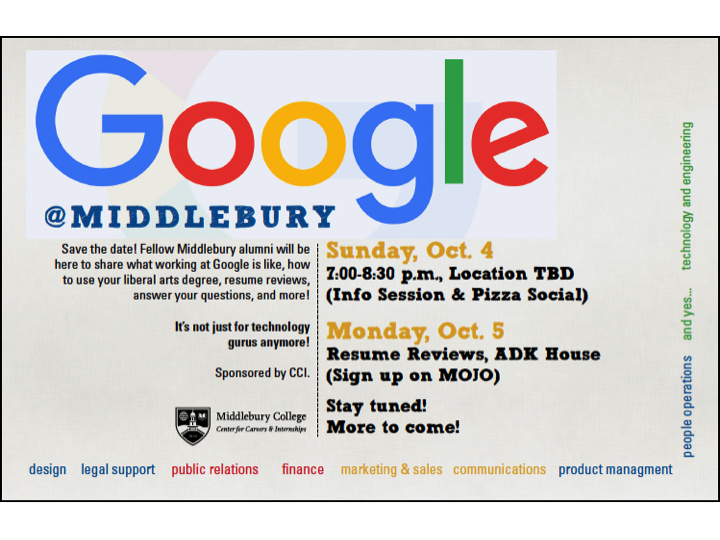 This event, sponsored by the Center for Careers & Internships (CCI), is an effort to connect our Middlebury students (you! ), with professionals (parents — it is Parent’s Weekend after all!) in the “real world” who have experience and careers working for the betterment of societal and environmental change. Whether they work in public service, a foundation, a nonprofit or the private sector, a social enterprise, in the media, as a social worker, volunteer, or serve on the Board of an organization—they will join with us to connect their stories and advice on the paths that led them to where they are today. We will facilitate an interactive exercise in the 1 hour allotted and are looking for student participation. Grab a friend and your parents and come enjoy the sushi. Please RSVP on MOJO (workshop). Have you had that first interview yet? Don’t agonize about what the employer is going to ask you. Instead, be prepared to know who they are (do your research) and know yourself (have you thought lately about what really motivates you?)! Here is a a quick guide to 50 Questions an employer might ask you if you were interviewing for a start-up or new venture: http://ow.ly/SBgjF. On selected Fridays in the 2015-16 fall and spring semesters, the Center for Social Entrepreneurship (CSE) will host reflective talks in which speakers will respond to the prompt: “What matters to me, and why.” During these lunchtime talks, students and other members of the Middlebury community will reflect on their own ‘story of self’ and offer insights about the challenges of effecting social change. On September 25th, please join us as Rabeya Jawaid ’16 shares with us what matters to her and why. To get regular reminders of the Reflection Fridays Series, join CSE’s Facebook site: https://www.facebook.com/MiddCSE. Learn more about why you should consider Peace Corps and come out to an on-campus event next week with a Peace Corps Recruiter!!! In July Peace Corps announced historic changes to its application process. The online form is doable in under an hour; you can help choose the country you’d like to volunteer in (there are still no guarantees) and what you’d like to do there; and you’ll hear within a year about that acceptance. By spending two years in a foreign country — often living with host families — PCVs become immersed in ways unheard of when travelling as a tourist. 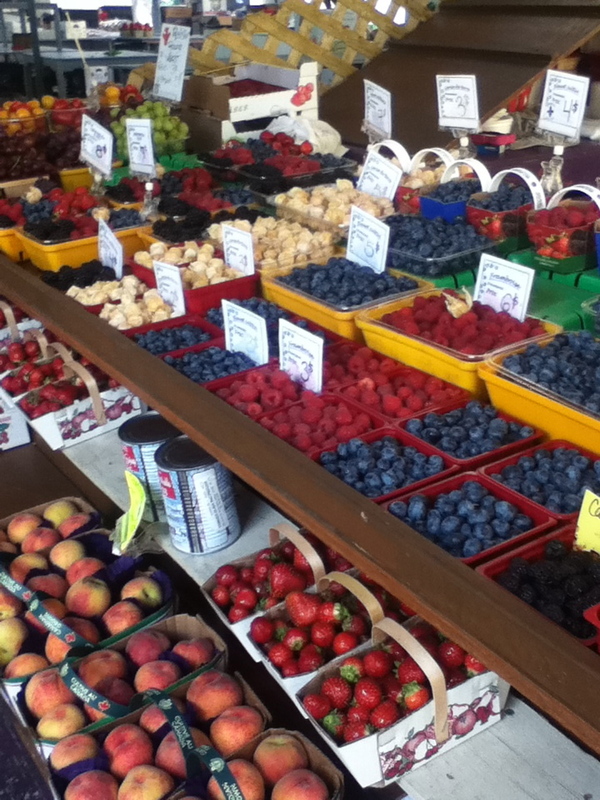 You’ll experience day-to-day living first hand, from the highs to the lows. Immersion naturally means volunteers speak that country’s language (that can mean drilling down to region-specific dialects). Yes, it’s a challenge, but once selected, PCVs undergo a two- to three-month training period during which they receive intensive language instruction from native speakers as well as technical details about their volunteering duties. Amazing opportunity to learn first- hand from leading business professionals and academics about your social impact at the Undergraduate Social Enterprise Summer Training Institute with Inspiring Capital!! Inspiring Capital is bridging the gap between business talent and high-potential purpose-driven ventures. They recruit, train, and place professionals, including MBA students, women re-entering the workforce, and career switchers, and work closely with social ventures to understand how private sector backgrounds and experience can enhance a venture’s sustainability and growth. The application to their Undergraduate Summer Institute deadline is fast approaching: on Sunday, April 5th. Apply now to learn from a cohort of tops students and MBA candidates interested in for-purpose careers in nonprofit, social enterprise and impact investing. Interested in leadership and social change? Check out the StartingBloc program and institute in New Orleans!! StartingBloc is built on the belief that a small, committed group of people can change the world. They bring together entrepreneurs, activists, educators, and innovators working to create change. 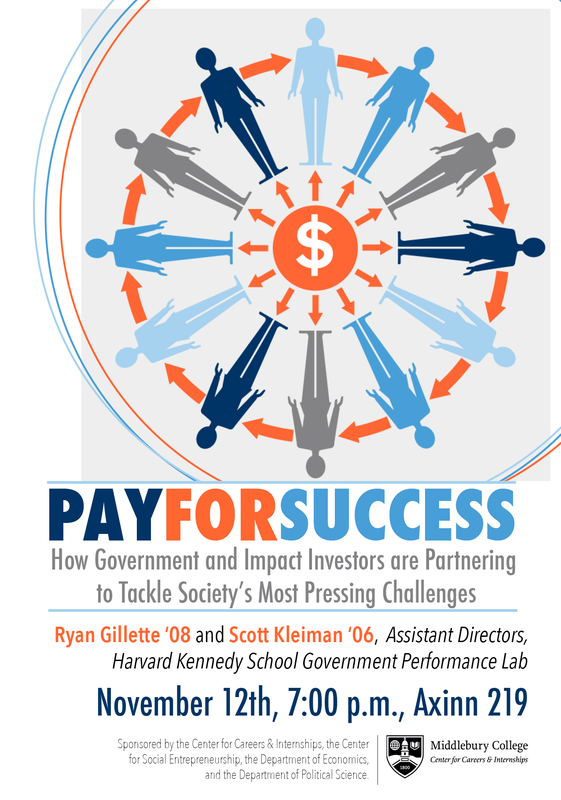 They connect them to their tribe and give them access to the resources, co-conspirators, projects and support they need to create the impact they want. They do this through a transformative 5-day experience where Fellows learn from proven change-makers, are pushed to take bigger risks, and find new life-long allies. As a result of StartingBloc, hundreds of Fellows have found meaningful work, launched new companies, and joined forces to tackle our world’s challenges. 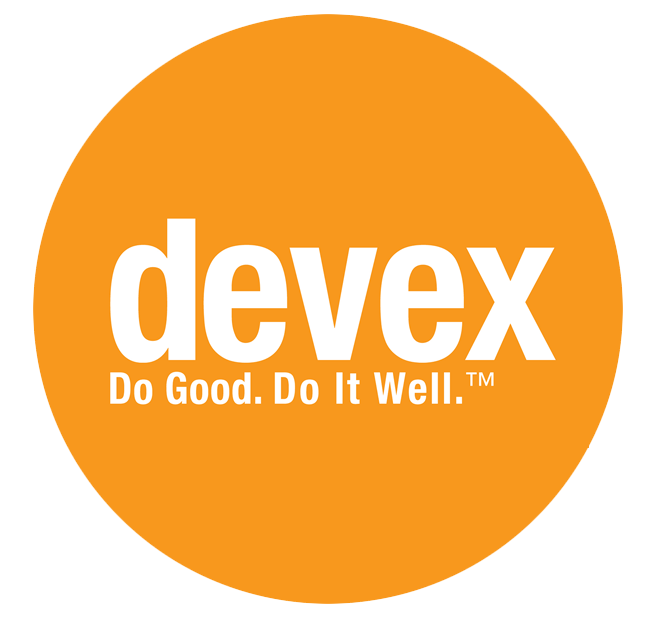 Check out the Devex website for career insights for aid and development professionals!! Just to give you a sampling of the types of articles on DevEx: Follow the link after the informational blurb below! “Speaking a second, third or even more languages is a common skill in the international development sector. Living in different countries provides ample opportunity for learning a new language, and those interested in this line of work tend to also be the kind of people attracted to foreign language study. Make sure to check out other articles and JOB postings on Devex too!! Want to make your Linkedin profile reflect your social impact? Subscribe to the Linkedin blog to see how you can accomplish that and more!!! The Linkedin blog is a great way to receive new insights and advice to better profile and connect with your career and network! Become a subscriber! 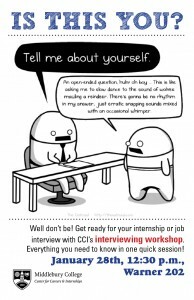 INTERVIEW WORKSHOP TOMORROW! 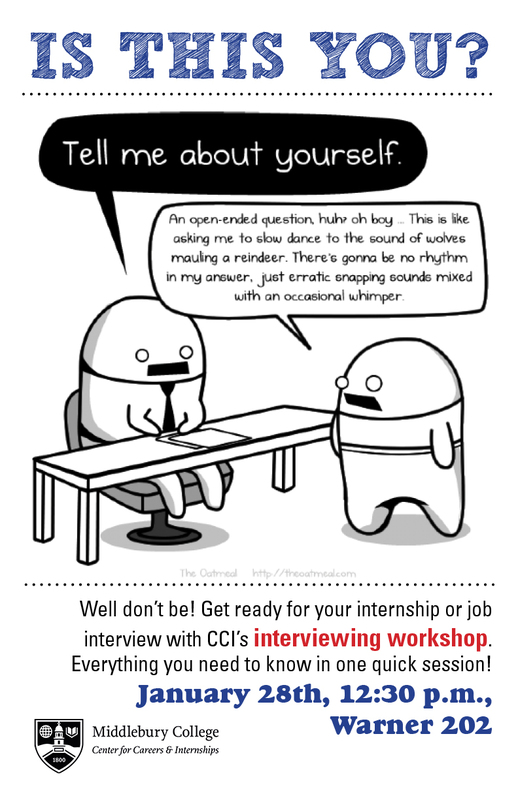 Get ready for your interview and learn all the necessary tips in one session! Interested in attending a conference focused on adjusting to post undergraduate life? 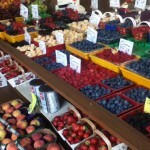 The Vermont Businesses for Social Responsibility is organizing an event just for you! 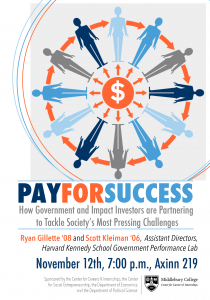 Vermont Businesses for Social Responsibility (VBSR) will be hosting a conference at Green Mountain College on Friday, April 10th for college students wondering about life after college and making an impact in the world. College students today want to engage in meaningful work that will bring about positive change in the world. At the same time, financial pressures lead many to question whether it is possible to follow their passions and still earn a decent enough living. This conference will explore the challenges and opportunities of doing both. Join VBSR for an inspiring series of TED-style talks from mission-driven entrepreneurs and leaders of change in business, government, and education. Student will get to engage with these and other leaders in stimulating discussions and meet with them informally. 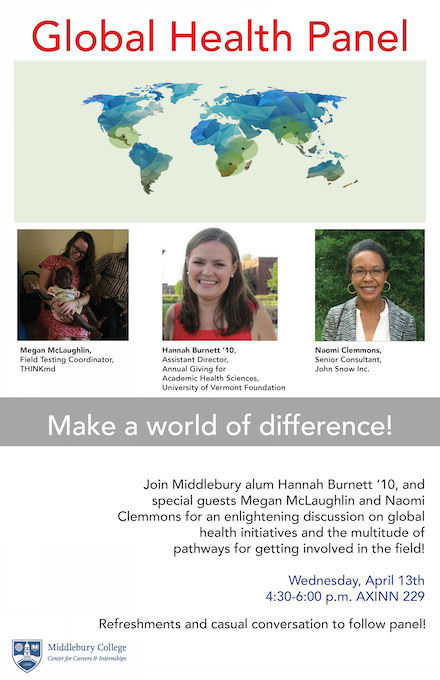 If you are interested in attending, please contact Tracy Himmel Isham at thimmeli@middlebury.edu. This event is FREE to the public! Welcome to the Class of 2018 and returning students! At the Center for Careers & Internships (CCI) we have a ton of NEW programming in store for you this year. Below, I’d like to both introduce you to some of the new features we’ve added to our offerings and mention some of the new ways we’ve re-organized the work that we do for you. Quick Questions = Drop-Ins: We have replaced our Drop-Ins with Quick Questions and the NEW hours are from 1-3 P.M. Monday-Friday at Adirondack House. Appointments to talk to an Adviser: We have a NEW online system in MOJO set up for you to make an appointment –appts. can be made at any time now–with one of our Advisers. Please check out the profiles of our Advisers first to determine who the appropriate Career Adviser is to talk about the areas you are most interested in. So PLEASE do not call our office anymore to make an appointment, instead it’s self-serve and you can make your own even when the Adviser is asleep! Senior JumpStart = Senior Meeting: We have replaced the infamous beginning of the year Senior Meeting with a NEW program called Senior JumpStart which includes a series of 1o career-related workshops ranging from the Arts to STEM. There is also a workshop for those of you that still don’t know what they want to be doing when they graduate. Each workshop is being offered twice at different times…so NO EXCUSES for not attending! Here is the link to a description of each Senior JumpStart workshop (go/ccijumpstart). I will be leading two different workshops on Careers in the Common Good and Careers in Environment & Energy. Meet our Sophomore Peer Career Advisers (PCAs): These are NEWLY dedicated sophomore students who are trained to answer your questions and to assist you in finding the right resources to point you in the right direction. Check them out here. Looking forward to meeting new students and welcoming back old faces!